To many Americans I encounter this seems pretty surprising. Not only that the tax payer is picking up the cost for everyone’s healthcare, but that we love it. Many news outlets in the states are very vocal on public services and people are constantly told how awful our healthcare is, how expensive it is, how people are having to pay money for poor people having the gall to be ill. Back during all the US electioneering I even saw some Americans claim that ‘socialism’ in the UK has lead to health services that deliberately kill old and ill people for being a drain on society, and that’s why ‘socialism’ is bad. Imagine the surprise of so many when Danny Boyle included a massive tribute to the NHS in the Olympic opening ceremony. While we were cheering and hailing Danny-boy a hero, planning out his knighthood, over the pond there was a resounding ‘wtf’. People are living longer. People with disabilities and illnesses who may not have survived previously, are now living full lives thanks to improved medical and community support as well as advancements in medical science. Overall we’ve been doing a great job with healthcare. 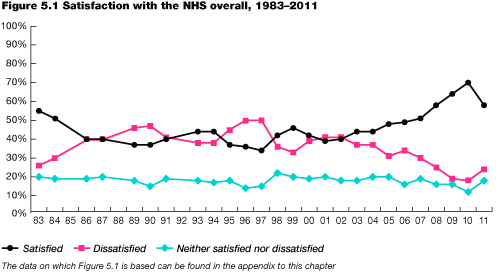 Satisfaction with the NHS has been climbing for years. We’re all getting happy and stuff about healthcare! Check out this graph from NatCen. Graphs say stuff better than I can 99.99999% of the time, because they’re graphs and I’m not. 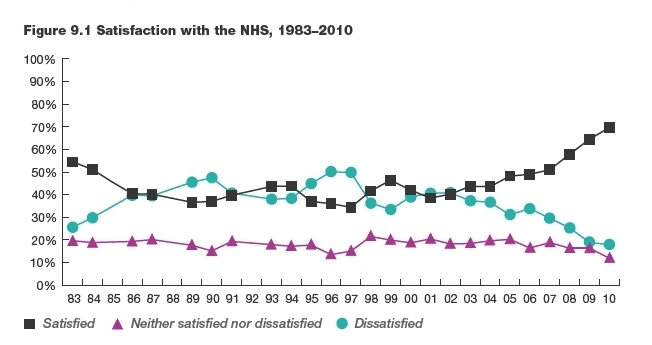 More NatCen British Social Attitudes This time with less happy. What could have gone so wrong that satisfaction has dropped so startlingly in such a short space of time? There’s an awful lot I can say about these two men. This time I’m going to try and stay on target though. Try and express what they’re doing to our public services and the resounding fear both in the health service itself and the public as a whole. How this undemocratic, right-wing, coalition Government have reneged on the promises they made during the election and are actively attempting to dismantle such a loved British institution, selling off NHS England to the likes of Beardy Branson, while whitewashing the public by seemingly blackmailing the BBC into not reporting it. We’re all aware that cuts to the NHS are happening. Many of us have experienced this on a personal level; fighting to keep a community hospital open, local wards shutting, lack of maternity services, lack of mental health services, increased waiting times in A&E or more time spent on waiting lists for ongoing outpatient care. What many people are failing to realise at this particular moment in time is that not only are cuts being made but the NHS has become a free for all for big business in England at the moment. Chunks of it are being sold off to the highest bidder and a competitive market is being made out of what we’re continuing to believe are ‘public’ health services. While this is going on doctors are screaming at the BBC to report it to the masses so everyone can be suitably angry. The only air time it’s been given recently is when the Royal College of Practitioners’ medical director came out to say “the system can’t cope much longer”, only to have Dan Poulter, a medical doctor and undersecretary of Health who’s already come under heavy fire for a statement he made about the amount of hours he would work as a junior doctor, pick a figure out his backside to try and shut down the criticism. At this point the BBC then went quiet again while Dr Dan went back to trying to figure out if 1 plus 1 really does equal 2, or if he should just forget maths and start on creating his own numerical system. How has all of this privatisation been allowed to happen? 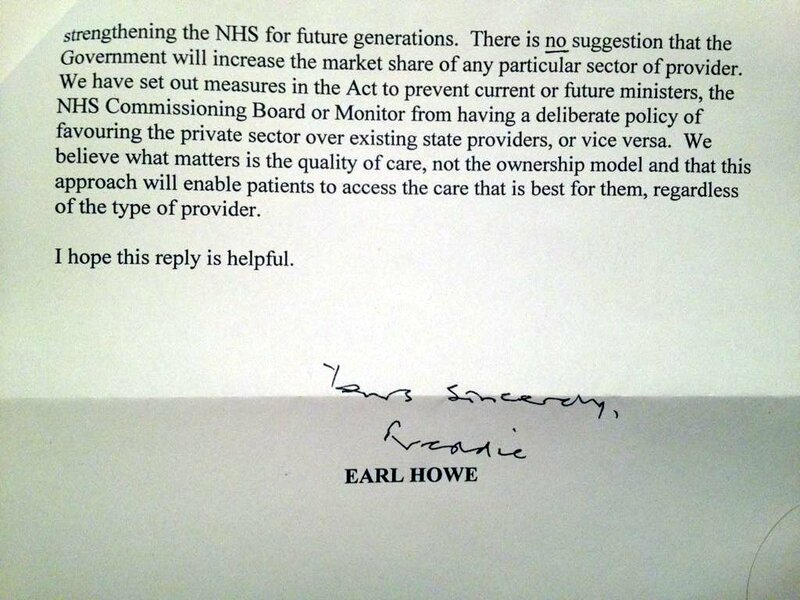 The ‘Health and Social Care Act‘. I want to make clear at this point, as Ronnie Barko has just reminded me on Twitter, this is not just the Conservatives and the Liberal Democrats. With the PFI fiasco that’s gone on, Labour have their share of responsibility too. They have paved the way for this to happen and equally need to be forced to move away from this idea that it’s okay to auction off the NHS. Another part of this is the fact that, although cuts are happening in places across the board, the mass privatisation is currently an English problem. Wales and Scotland in particular are doing all they can to protect themselves. I’m sure we all remember the promises that were made by the parties during the election. 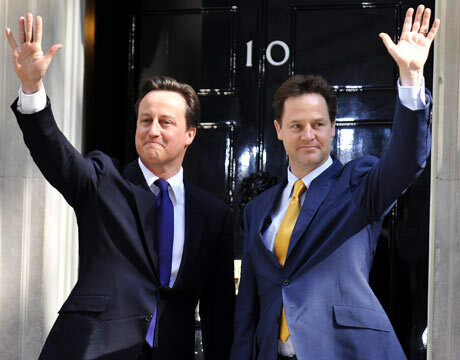 ‘We’ll cut the deficit, not the NHS!’. What they meant by this is ‘We’ll remove ourselves of responsibility by selling everything off under your noses’. This bill came through in March of this year. It was contested heavily by doctors, it was spoken about very little in the media, and the average person on the street had absolutely no idea it existed. They still have no idea it exists. For a breakdown of what the HSC act means, I refer you to Marcus Chown, renown on twitter for his protests over the breakdown of public services and the failures of our supposedly ‘apolitical’ news service (rumoured to have a top Tory and a person from Atos in the higher ranks) to inform the public. His briefing can be found here. I know I’ve included a lot of links on this page, but if the HSC act in it’s entirety is something you cannot quite absorb, this will put it into perspective for you. I was really hoping to pick apart the act and give an explanation of the ramifications, and may edit my own assessment of the act at some point (although keep in mind this is from an interested party, not a legal standpoint). Aside from not being able at present I also feel Marcus has done this brilliantly. As you can see from the linked briefing, the severity of it and the impacts it’s going to have on the NHS and thus the lives of many, it’s a disaster. My post so far sounds like anti-government scare mongering up until you actually read the act. It’s impact is going to have a tragic effect on this country, and what the government is currently doing will be very hard to undo. The Great Sell-Off is going to be remembered in a similar way to some of Thatcher’s actions, but even she didn’t go this far. Given the severity of what’s occurring, how strong and utterly deplorable this act is, it’s absolutely no secret that the media is wilfully ignoring this story. Many, many people have complained to the BBC, and all that I’ve heard of personally have been given a fob off answer as to how their complaint is of import to them, etc, etc. The responses are often outdated and pre-planned. Unfortunately without having an elected official of some kind, along with a journalist independent to the BBC, being CC’d into all complaints, there is little chance of them being held accountable. Unfortunately no such elected official or journalist has come forward. The lack of BBC coverage hasn’t even been called out by the likes of the Guardian. Open Democracy have released a report, damning the BBC for 2 years of betrayal over the reporting of the HSCA. The full PDF of this report can be found here. Not long after initially posting this, the BBC are finally reporting on what’s been occurring in the NHS, but sadly the way they’re reporting continues to be immensely skewed. They used Thursday 27th September to do a ‘special report’ on issues within the health service but flouted the standard government line as being fact, where as concerns from people were just that, concerns. Another person who has been immensely vocal on the great NHS auction is Dr Éoin Clarke (PhD), his blog ‘The Green Benches’ has been covering the HSC act, as well as the behaviour of MPs such as Jeremy Hunt, the failings of Virgin Care, the BBC cover up.. All of it is well sourced and I highly recommend you read as much of it as you can. Costs, savings, losses, actions of individual MPs, who profits, what it means for your care, Trusts that will have services privatised, it’s all there. It’s worth mentioning at this point, since a few folks continue to believe that the NHS is a massive drain on the UK economy (mostly due to the fact we keep being told it is by right wing media), that we actually have the fairest and most cost effective health services in the developed world. For those who honestly believe that the idea of an insurance plan would be better, here’s a PDF that makes a comparison of the systems. This is not a story that has gone unnoticed in the international media, either. RadioNZ in New Zealand have picked up on it as well. I recommend listening to this podcast, where the situation is explained very well. Many, many people have written to their local MPs to try and get a response on where they stand regarding the act and the outsourcing of services. I would absolutely URGE you to do this. In sending a letter to your MP, you don’t have to justify why you want answers. All you need to do is state that you are concerned, say you think it’s awful and ask where they stand. They are your elected official and are supposed to answer to you. Remember that your MP works for you. A kind of example letter of what to write can be found here. Below is the one that I sent to my own MP, Mark Harper. It’s the above letter with a single line added. It doesn’t matter what you write as long as they know you’re a constituent and you’re worried. I am strongly opposed the UK government’s “reforms” of the NHS, which will result in the dismantling and selling off to private companies of one of our most precious and valued institutions. The NHS is one of the fairest, most efficient and cost-effective health services in the world www.tinyurl.com/3qf92zc . Yet, according to the Faculty of Public Health’s risk assessment, the government’s reforms will lead to a loss of comprehensive care, reduced quality of care, greater expense and greater health inequality http://tinyurl.com/c4fx6n5 . This is a national tragedy and I will not be voting for anyone who does not oppose these deeply damaging reforms. I’ve since received a response from Mr. Harper which followed the standard Tory line of spiel. The full correspondence can be found here. As much as it seems nothing we say is going to change things, that attitude itself is not going to help. ‘If I send a letter to my MP it’s only going to end up in a shredder’. I’ve heard this so many time lately from people who feel utterly defeated by the state of the government. This is not what this country is, it should not be like this, and for that alone you should be furious at those creating this kind of oppressed feeling. And what if your MP is receiving a BOX full of letters every day? All saying the same thing? All from different constituents that are angry? That’s going to be an awful lot harder to ignore. Even better, make your letter public. Set up a blog if you have to and find people willing to share it, also share the response. The more public the correspondence is, the harder it is to be ignored. Many people are already sending letters, as I’ve stated, and I’ve just come across someone who has contacted Frederick Richard Penn Curzon, 7th Earl Howe and a Conservative front bench member of the House of Lords. He’s a Parliamentary Under Secretary of State at the Department of Health. 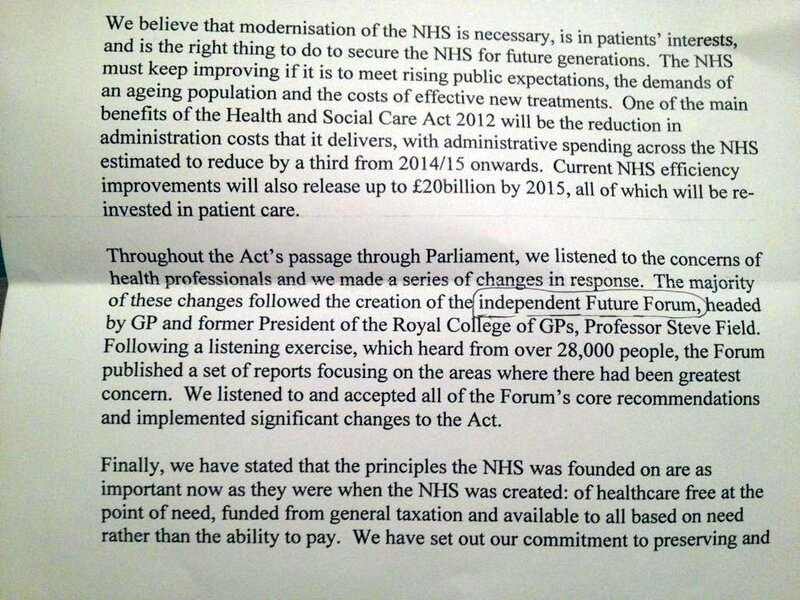 The letter was expressing concern at the current state of affairs within the NHS, here is the response. Note the underline at the top of that second page? Yeah, so did the person who contacted him in the first place, along with myself and a few others. Seems a little inconsistent, no? In order for word to spread, people need to be willing to spread it. Doing things such as the above and finding out opinions of MPs and officials is a huge step towards clarity, and showing of distaste towards what’s happening. We need to talk about it, to encourage discussion and allow everyone to be aware. People need to be told what’s going on, learning everything for themselves and coming to conclusions (hence including all of the links in this post). We have to stand up. In a Q&A sessionEd Milliband has stated that, although the act won’t be repealed and CCG’s will be kept in place, he’ll bring back the core principles of the NHS, stating “co-operation, not competition” should be involved. This isn’t satisfying many people as they want the act repealed in it’s entirety. After saying this he did the fastest U-Turn in history, something which wouldn’t be out of place on the show ‘The Thick of It’. His office stated he would repeal the act, but the structure of the NHS under Labour is still under immense scrutiny. Andy Burnham is adamant that the HSCA will be repealed, there are ‘no promises’ that the private sector will not have a stake, leaving many people sceptical about how they would approach the issues within the NHS. We’re a democracy. We can exercise our rights, make your voice heard loud and clear. If we’re still not being heard? Shout louder. Right now we need all the voices we can find because our Government has decided to go deaf. Our Government is refusing to be accountable for their actions. They are doing all they can to take away the NHS from the people it belongs to – us. While stealing it from us, selling it off, profiting from the sales, they’re still leaving that ‘National’ label on it and referring to it as ‘creating competition’ on the BBC to make you think it’s still the same as it ever was. Telling you that services will improve. All the while taking away services that you, a loved one, a friend or an acquaintance may need one day. Don’t let it happen. Make your voice heard.